The following are the latest results contributed by HM Courts Service, for cases sentenced by West Sussex Magistrates’ Court sitting at Worthing from October 13 to 18, 2017. Joy Charlton, 51, of Lansdowne Road, Angmering, was fined £153 and must pay £30 victim surcharge, £85 costs, after admitting driving over the 30mph speed limit in Ditchling Road, Brighton, on September 8, 2016. Her driving record was endorsed with three points. Elizeu Da Silva, 39, of Muir Court, Rectory Gardens, Broadwater, was fined £253 and must pay £30 victim surcharge, £85 costs, after admitting drink-driving (68mg of alcohol in 100ml of breath) on the A27 Lancing on September 26, 2017. He was disqualified from driving for 18 months. Carole Draven, 58, of Eirene Road, Goring, was fined £400 and must pay £40 victim surcharge, £85 costs, after admitting driving without due care and attention in Teville Road, Worthing, on May 15, 2017. Her driving record was endorsed with six points. Sandra Griffiths, 53, of Garden Crescent, Barnham, was discharged conditionally for 18 months and must pay £20 victim surcharge, £120 costs, after admitting dishonestly making a false statement to Arun District Council with a view to obtaining Housing Benefit in Bognor Regis on January 26, 2016. She was also discharged conditionally for 18 months after admitting dishonestly making a false statement to the DWP with a view to obtaining Employment Support Allowance in Bognor Regis on March 12, 2016; and dishonestly making a false statement to the DWP with a view to obtaining Employment Support Allowance in Bognor Regis on January 30, 2016. In each case, she failed to mention that she was in receipt of an annuity and her husband was working. Gwyn Jones, 49, of Coleridge Crescent, Goring, was fined £120 and must pay £30 victim surcharge, £85 costs, after admitting drug-driving (9ug/l Delta-9-THC) in Littlehampton Road, Ferring, on August 1, 2017. He was disqualified from driving for 16 months. Richard Murrell, 47, of Windmill Close, Upper Beeding, was discharged conditionally for 12 months and must pay £20 victim surcharge, £85 costs, after admitting being drunk and disorderly in Church Lane, Upper Beeding, on September 27, 2017. Scott Nickson, 47, of Hillcrest Road, Bromley, was fined £120 and must pay £30 victim surcharge, £85 costs, after admitting drug-driving (4.2ug/l Delta-9-THC) in Littlehampton Road, Ferring, on May 31, 2017. He was disqualified from driving for three years. John Saunders, 71, of Old Shoreham Road, Portslade, was fined £461 and must pay £46 victim surcharge, £85 costs, after admitting drink-driving (89mg of alcohol in 100ml of breath) in High Street, Shoreham, on September 29, 2017. He was disqualified from driving for 22 months. Williams Bah, 32, of Wick Farm Road, Wick, was given a 12-week prison sentence, suspended for 12 months, with 16-week curfew, electronically monitored, from 8pm to 6am, and Rehabilitation Activity Requirement after admitting failing to provide a specimen for analysis when required by police in Worthing on September 16, 2017. He must pay £115 victim surcharge, £85 costs, and was disqualified from driving for three years. He also admitted, driving without insurance, no separate penalty. 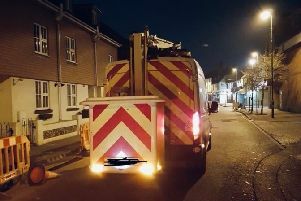 Heidi Deamer, 44, of Arundel Road, Littlehampton, was given a community order with eight-week curfew, electronically monitored, from 9pm to 6am, and must pay £85 victim surcharge, £85 costs, after admitting failing to promptly notify Arun District Council of a change in circumstances affecting Housing Benefit in Littlehampton between March 14, 2016, and August 28, 2016; and failing to promptly notify the DWP of a change in circumstances affecting Employment and Support Allowance in Littlehampton between March 11, 2016, and August 25, 2016. Paige Craddock, 22, of Normandy Road, Broadwater, was given an eight-week consecutive prison sentence, suspended for 12 months, with Drug Rehabilitation Requirement, and must pay £72.50 compensation, after admitting jointly stealing vodka worth £145 from Beales, Worthing, on July 5, 2017. She was given an eight-week concurrent prison sentence, suspended for 12 months, and must pay £49.98 compensation after admitting jointly stealing earphones worth £99.96 from HMV, Worthing, on June 7, 2017. She was given an eight-week concurrent prison sentence, suspended for 12 months, and must pay £26 compensation after admitting stealing clothes worth £26 from Peacocks, Worthing, on June 20, 2017. She was given an eight-week concurrent prison sentence, suspended for 12 months, and must pay £14.10 compensation after admitting stealing a wing mirror worth £23.50 in Worthing on July 15, 2017. She also admitted breaching a suspended sentence order, which was amended to include five extra days’ Rehabilitation Activity Requirement. Arron Jones, 24, c/o Clarendon Road, Worthing, was given an eight-week consecutive prison sentence and must pay £72.50 compensation after admitting jointly stealing vodka worth £145 from Beales, Worthing, on July 5, 2017. He was given an eight-week concurrent prison sentence and must pay £46 compensation after admitting jointly stealing jeans worth £46 from Peacocks, Worthing, on June 23, 2017. He was given an eight-week concurrent prison sentence and must pay £49.98 compensation after admitting jointly stealing earphones worth £99.96 from HMV, Worthing, on June 7, 2017. He was given an eight-week concurrent prison sentence, suspended for 12 months, and must pay £14.10 compensation after admitting stealing a wing mirror worth £23.50 in Worthing on July 15, 2017. He also admitted breaching a suspended sentence order and was dealt with for the original offences, with one eight-week suspended sentence for theft implemented and a second eight-week suspended sentence for theft implemented to run concurrently. Martin Perryman, 62, of Beeches Avenue, Broadwater, was given a 12-week prison sentence, suspended for 18 months, with Programme Requirement and Rehabilitation Activity Requirement, and must carry out 120 hours’ unpaid work after admitting assault by beating on the A27 Sompting bypass on October 3, 2017. He must pay £150 compensation, £115 victim surcharge, £85 costs. He also admitted using threatening words or behaviour likely to cause distress on the A27 Sompting bypass on October 3, 2017; and resisting a police constable in Worthing on October 3, 2017, no separate penalties. Samuel Rayner, 20, of Mile Oak Crescent, Southwick, was given a community order and must carry out 60 hours’ unpaid work after admitting drink-driving (77mg of alcohol in 100ml of breath) in Buckingham Road, Shoreham, on October 1, 2017. He must pay £85 victim surcharge, £85 costs, and was disqualified from driving for 20 months. Andrew Walden, 50, of West Way, Wick, was given an 18-week prison sentence, suspended for 18 months, and must carry out 240 hours’ unpaid work and pay £200 compensation, £115 victim surcharge, after admitting assault by beating in Littlehampton on June 25, 2017. He must also pay £200 compensation after admitting a second charge of assault by beating in Littlehampton on June 25, 2017. Jay Walden, 20, of Winterberry Way, Wick, was given an 18-week prison sentence, suspended for 18 months, and must carry out 240 hours’ unpaid work and pay £200 compensation, £115 victim surcharge, £150 costs, after admitting assault by beating in Littlehampton on June 25, 2017. He must also pay £200 compensation after admitting a second charge of assault by beating in Littlehampton on June 25, 2017.